Awareness of autism and how it affects children and families is growing. Awareness wristbands can help spread the word and show support for people living with autism. At AmazingWristbands.com, you can create a custom message for your wristband and select from a wide range of colors. All our wristbands are made of comfortable, latex-free, and non-allergenic silicone. Your autism awareness wristbands can have a generic message such as "Support Autism Awareness" or "Building More Good Days". Or, they can be something more personal, such as "I Love My Son with Autism". Autism awareness wristbands show support, raise awareness, and can also be used to raise funds for autism research and patient services. The recognized awareness month for autism is April. A puzzle graphic is often used to represent autism, symbolizing the vastness of the spectrum of autistic conditions. Recognized colors for autism are blue, red, green and yellow, with people often using a combination of all these colors to demonstrate the diversity of people living with autism. According to the Autism Society of America, Autism affects an estimated 1 in 100 births, and about 1.5 million Americans today are believed to have some form of autism. This number is on the rise, and more research is needed to develop effective treatments. Autism is a complex developmental disability that typically appears during the first two years of life. It impacts development in the areas of social interaction and communication skills. Both children and adults on the autism spectrum typically show difficulties in verbal and non-verbal communication, social interactions, and leisure or play activities. Why Buy Autism Awareness Wristbands from Amazing Wristbands? 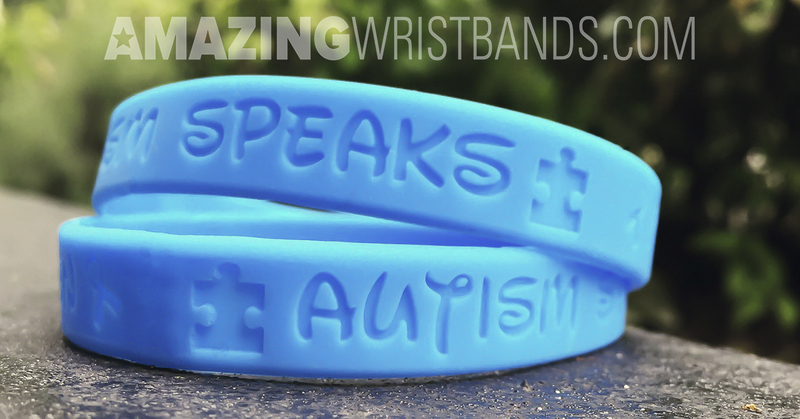 Amazing Wristbands is a leading provider of personalized silicone rubber bracelets available online, including autism awareness bracelets. Our wristbands are comfortable, durable, and non-allergenic. Most importantly, our wristbands are yours, and can be customized in a variety of ways. Our professional and friendly customer service agents will help you design your customized autism awareness wristband. We offer a wide variety of types and colors to help your autism awareness rubber bracelets stand out. In addition to standard wristbands, AmazingWristbands.com also offers slap bands, adjustable bands, USB bands, silicone rings and silicone key chains. 100% Silicone for your autism awareness campaign. FREE Shipping for autism awareness wristbands in the U.S.
FREE artwork and design for your autism awareness wristbands. FREE Color Matching – choose blue, green, yellow, red, or a combination of colors for your autism awareness wristbands! Get a detailed quote for your autism awareness wristbands in minutes! Hello, we are getting ready to budget for our 2018 Hero Walk for Autism. I love your thin bracelet that has "support autism awareness" in different colors. Can you tell me how much 1200 of the adult-sized bracelets would be? Thank you.